Our app gives you the option to record nap start times and end times separately or together. Children who are marked as "napping" will have a special icon next to their profile picture as a reminder for you to record when they wake up. 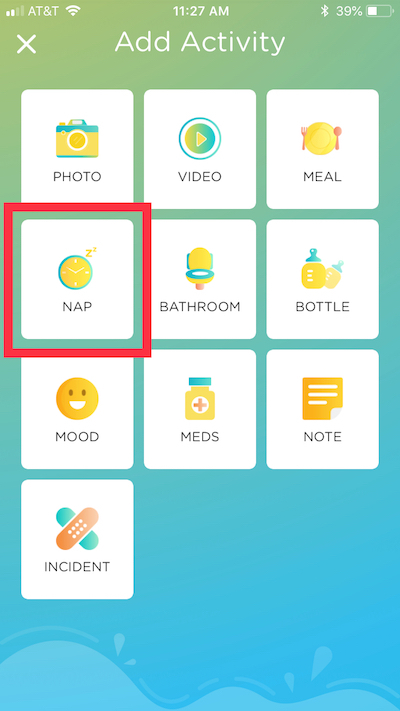 When recording a nap on the Kinderlime app, click on "Activity" from the home screen and select "Nap." Choose the children who are going down for a nap, then hit "Next." The start time will be highlighted in blue, and the end time will be listed as blank. NOTE: Unless you already know what time the children will wake up, be sure not to touch the "End Time" box. Once it has a value in it, you can't go back to the blank state. When you're ready, click "Add Activity" to record when the nap started. 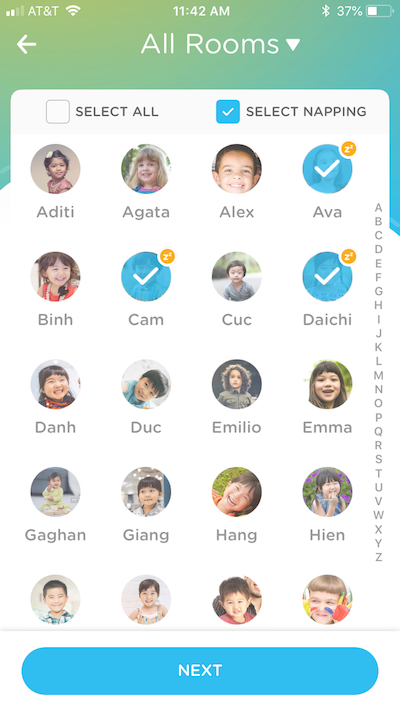 The children will appear on your home screen with a napping symbol next to their profile pictures. To record when the children's nap ended, go back to Activity --> Nap. You'll have the option to select only the napping children. 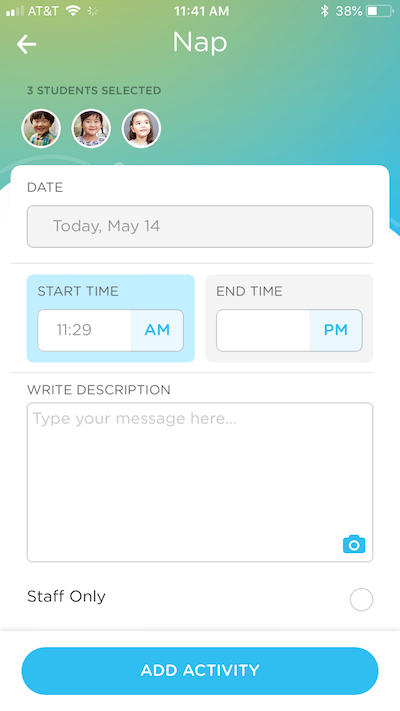 From there, you'll be able to review the "End Time," add any notes, and add the activity. 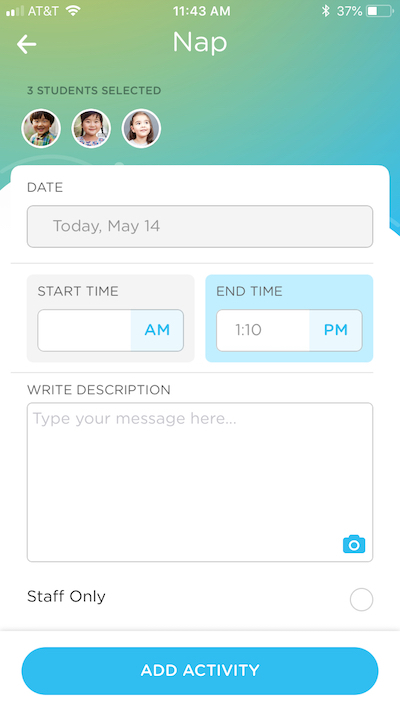 Parents will receive a push notification whenever you record a start or end time for a nap. It is best to leave the start time blank when entering the end time for a napping child. If the start time you enter happens to be different from the one you had entered earlier, parents will receive conflicting information. 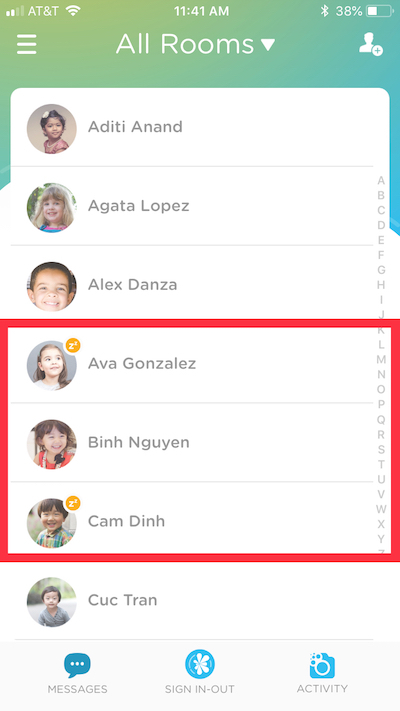 Naps recorded on the website using the "Create Activity" button from the Parent Connect --> Daily Activities page do NOT have the option to record start/end times separately.